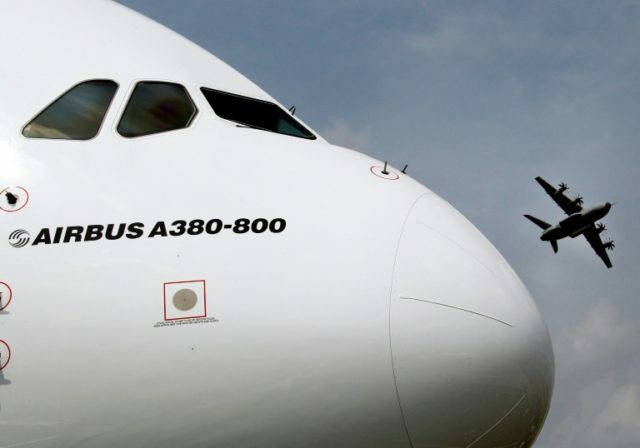 Toulouse (France) (AFP) – Aircraft giant Airbus is to axe around 3,700 jobs in Europe as it cuts back production of its troubled A380 superjumbo and A400M military transporter, the company and union officials said Wednesday. The cuts come as France-based Airbus downscales deliveries of the under-selling A380 — the world’s biggest passenger jet — from eight this year to six in 2020. It also plans to slow production of the equally problematic A400M, as part of a bid to extend the life span of the two ailing aircraft while trying to win more orders. The company said “up to 3,700 jobs” in France, Germany, Britain and Spain would be affected by the drop in production, without saying whether the posts were being cut or moved elsewhere. But Force Ouvriere, the biggest union representing Airbus staff, said after a meeting with company executives that Airbus was planning to shed 3,720 jobs while avoiding outright redundancies. “At no moment was there any discussion of outright layoffs,” union leader Jean-Marc Escourrou said after the meeting at Airbus headquarters in the southwestern French city of Toulouse. Temporary jobs and subcontractors will be the first to go, starting in about three months time, he added. The jobs lost will include 1,900 in Germany, 850 in Spain and 470 in France. Britain will lose 450 jobs at the Filton factory in the southwestern city of Bristol, which builds wings for the A400M, said FO official, Yvonnick Dreno. “The falling rate for the A400M will affect them 100 percent,” he said. In France, affected workers will likely be moved to more profitable production lines, such as the single-aisle medium-haul A320 and the wide-body A350, the unions said. Airbus said in a statement that it was “committed to managing any implications for its workforce in a responsible manner”. “The company is confident that it will be able to propose opportunities to most of the affected employees through programmes which are being ramped up,” it added. Airbus had in January warned it would have to halt production of the A380 altogether unless it received new orders. Emirates Airlines, already the biggest customer for the giant plane with 101 in its fleet and 41 more on order, threw it a lifeline days later by striking a $16-billion deal for 20 more of the jets with an option on a further 16. Airbus decided in 2007 to pursue the A380, capable of packing in 853 seats — a move diametrically opposed to rival Boeing’s bet on the Dreamliner, marketed as a more efficient plane that could be used for both medium and long-distance flights. But the costs of the four-engine A380 have proved daunting, with airlines having to operate every flight at full capacity in order to make a profit. The A400M programme, one of Europe’s most ambitious joint defence programmes, which has drawn in Belgium, Britain, France, Germany, Luxembourg, Spain and Turkey, has also been dogged by setbacks, including cost overruns and delivery delays. The head of Airbus Commercial Aircraft, Guillaume Faury, downplayed the planned adjustments during a parliamentary hearing Wednesday, saying that increases and decreases to staffing on various projects were a routine part of the business. Airbus employs 133,000 people worldwide.